She:kon! My name is Megan Lewis; I am a Kanien’kehá:ka woman currently residing in Tkaronto, Ontario. As a member of Tyendinaga Mohawk Territory, but having grown up off reserve anywhere from 200 kilometers away in urban areas of Ontario, to 1,000 kilometers away in rural areas of New Brunswick and Nova Scotia, I did not grow up very connected to my culture or community. However, throughout high school I started to learn more about my familial history and culture and that sparked a journey of self-discovery and reclamation that I am still on. Having recently completed my undergraduate degree in Child and Youth Care, and my Masters degree in Public Policy and Administration from Ryerson University, I have developed a passion for the advocacy of Indigenous and LGBTQ2S+ people and communities through education. 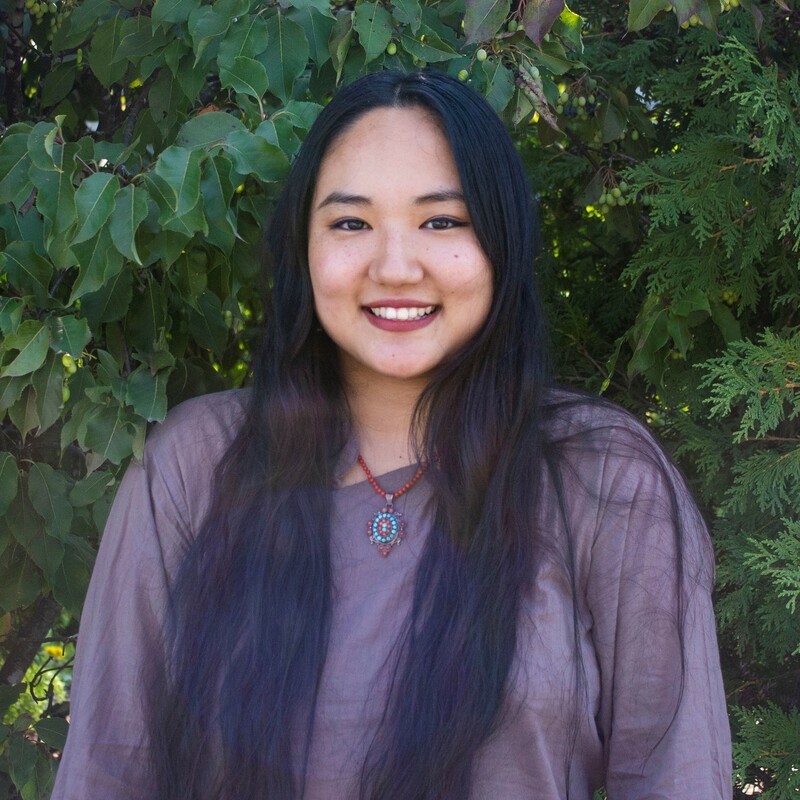 Having completed my time as a student, I wanted to continue my involvement with the Indigenous community and that is when I applied to be a part of Canadian Roots Exchange; because it allows for the opportunity to make a difference in the perspectives and lives of both Indigenous and non-Indigenous youth and young adults through education. Currently working with the Public Health Agency of Canada after spending many years working in community based organizations, I continue to strive to make connections between policy and practice. In my spare time I enjoy photography, getting out of the city, guest lecturing and sharing knowledge, and I have recently taken up archery. Hi! My name is Bella Lyne (They/Them/She/Her) and I’m a white settler of mixed European decent living on Dish With One Spoon Wampum Covenant Territory, in Toronto, ON, the traditional lands of the Anishinaabe, Haudenausaunee, and Wendat Peoples. I pride myself on being a curious human with a particular interest in human relationships to place, land and ancestry. I have a bachelors degree from Quest University Canada (located on Squamish Nation unceded territory) where I studied cultural geography. Currently, I work as a program coordinator and community arts intern at community arts organizations Jumblies Theatre and Arts4All. I am passionate about dialogue and facilitation with a particular interest in Theatre of the Oppressed and other embodied practices that help us deepen learning and grow empathy. For me, participating in tYRI is about being part of a movement to transform Indigenous non-Indigenous relations on turtle island and about upholding my responsibilities as a treaty person living in this territory. Meriya was born within the Dish with One spoon Covenant in Tkaron:to that is situated on the traditional and current territories of the Haudenosaunee, the Anishinaabee, the Huron-Wendat and the Mississauga’s of the New Credit. She is a white, cis-gendered, queer, survivor and a first generation settler with German and Scottish ancestry (Also a Scorpio moon). She has been involved in outdoor education and youth empowerment for over 8 years and has gained valuable insight into how important connection to land, relationships and one’s gifts are when working in community. She grew up in Colborne, Ontario and has since moved over 15 times and has been shaped by different communities in southern Ontario (Huron-Wendat), northern Ontario (Robinson-Huron Treaty 61), Squamish, Vancouver (Skwxwú7mesh, Tsleil-Waututh) and Whitehorse (K’wanlin Dun, Southern Tutchone, Ta’an Kwäch’än). She has earned her undergraduate degree from Quest University and focused on “What is Unspoken?” in relation to exploring intersections of mental health and identity through a sociology, educational and community arts lens. As a white settler, she feels it is important for her to really understand the legacy of violence, erasure and discrimination towards indigenous people that comes before her. She is also motivated to engage white settler communities to do the necessary self-work and systemic work that is needed before “reconciliation” can take place. She is filled with gratitude at the opportunity to be working with the incredible folks that make up the TYRI team and is excited to be apart of building a new legacy that is led by indigenous and non-indigenous youth. Aanii! My name is Jessica Sherk and I live on Treaty thirteen territory in Aurora, Ontario. I have mixed Indigenous-European settler background. My mother is Ojibwe and my father is a European (Scottish and German) settler. As the daughter of a 60s scoop survivor, I’ve only begun to reclaim my Indigenous culture and identity in the last few years. This journey started through different opportunities in my social work program at Ryerson University. A quote I saw recently really speaks to my motivation for wanting to be involved in this amazing initiative: “Leadership isn’t about advancing yourself; leadership is about advancing your people”. Hi ! My name is Ysabel ! I was born in Manila, Philippines but grew up in tkaronto / GTA but most recently have called Nogojiwanong (Peterborough), the place at the end of the rapids, my home. Now that I’m back in tkaronto, I’m excited to be a part of the tYRI and to build relationships with this community. There are many reasons as to why I joined the tYRI and have been trying to unpack what it means to be part of reconciliation in a meaningful way as I am curious and feel obligated as a settler to be a part of making positive change in the face of ongoing settler-colonialism. I’m also currently in school for social service work, in the immigrants and refugees stream and do migrant justice solidarity work. I also like to watch reality tv, silly viral videos and go camping.